Call 440-323-5421 or Stop in our Elyria Location for availability HANDMADE ARTISAN JEWELRY At Lizzy James we believe that jewelry should be fashionable, creative and comfortable. Everything in the Lizzy James collection fits these needs by combining style, form and function in each handmade piece. Featuring leather wrap bracelets that can also be worn as necklaces with large secure clasps, Lizzy James jewelry can transition flawlessly from day to night, casual to formal. Each piece is made in the USA by artisans whose expertise, passion and energy make the jewelry come alive in a thoughtful and balanced design. Flowers convey a message that cannot be put into words. PUFFER'S FLORAL SHOPPE, INC. of Elyria, OH provides a variety of fresh, fashionable floral designs to ensure that your gift is one of elegance and beauty. When you're looking for a unique hostess gift, token of appreciation or just a surprise to brighten someone's day, let PUFFER'S FLORAL SHOPPE, INC. customize and deliver one of our many fun, decorative & luxury gifts! We create dazzling presentations that are sure to please for any gift-giving occasion. 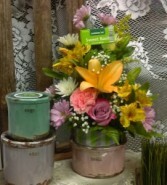 To get your custom gift items, come by and see PUFFER'S FLORAL SHOPPE, INC. - your local Elyria, OH florist.